The inspiration for this week’s post came to me while standing in a store picking out Mother’s Day cards. I was in search of a mother-in-law Mother’s day card, and I became puzzled by the fact that the store only offered one option. But, the store offered several card options if you wanted to give a Mother’s Day card from a dog or a cat. I thought to myself, why would there be so few options for a daughter-in-law to give a card to her mother-in-law on Mother’s day? Could it be that the store doesn’t carry this card option because daughters-in-law don’t often purchase cards specifically for their mothers-in-law? The thought crossed my mind because most stories I hear about mothers-in-law and daughters-in-law are negative. I’ve heard stories from mothers-in-law, who believe their daughter-in-law isn’t good enough for their son and they don’t try to hide it. I’ve heard stories from daughters-in-law who believe their mother-in-law is just out to sabotage their relationship by regularly giving their opinions to their son wanted or not. These are just two examples of toxic stories, but there are many. It got me thinking about the mother-in-law and daughter-in-law dynamic. A good M.I.L. and D.I.L. relationship is important to the family unit. If the connection is bad, it could cause a lot of damage and have adverse effects on a lot of people. I have witnessed and listened to the challenges a troublesome in-law relationship creates in a marriage and a family, so having and maintaining a healthy relationship with my mother-in-law has always been something I have seen as important. I must note, every time I hear one of those horror stories I listed above, I feel more appreciative and thankful for the awesome mother-in-law with whom I was blessed. After researching this topic and using my experience as inspiration, I have compiled a list below of ways to help the mother/daughter-in-law relationship remain in good standing. Make a good first impression. You will likely meet one another in the early stages of the relationship before either of you know that you will be in-laws. A bad first impression can be challenging to overcome and forget. Be nice, be kind, be respectful. Respect the relationship commonality. It is important to acknowledge that both of you love and care for the same person (husband/ son). The daughter-in-law should respect the mother and son relationship. By this I mean, don’t speak ill of your guy’s mother. Also, you should never try to pit him against his mom it puts him in an awkward position and makes things uncomfortable. Likewise, a mother-in-law should respect the son and daughter-in-law’s relationship. Meaning, you don’t speak poorly about your child’s wife. Also, don’t interject yourself into your son’s relationship, again it makes things awkward and uncomfortable. Recognize your differences. Just because the saying goes, ” Men marry women like their mothers” doesn’t necessarily mean it’s accurate. Recognize you are different people with differing opinions and perspectives. You likely won’t approach anything the same way, and that is okay! Ask Questions – Don’t Assume. The best way to bond and get to know one another is to ask questions. Assuming never gets anyone anywhere. The only way a person will truly know the why behind an action, behavior or thought is to ask. Empathize. Mothers-in-law remember you were once in your daughter-in-law’s shoes, reflect on what you liked and disliked about your relationship with your M.I.L. Daughters-in-law recognize that a mother’s love for her child is unconditional and sometimes letting go or giving space isn’t easy. Also, acknowledge that one day you may be in her position. Speaking from a daughter-in-law point of view, my husband Bernard is a genuine, good-hearted man and that is because of the values and beliefs my father-in-law and mother-in-law instilled in him. I sometimes feel when I hear some daughters-in-law speak of their mother-in-law that they forget that the guy they fell in love with was raised by the woman with whom they are at odds. However, I admit that some mothers-in-law don’t make it easy. 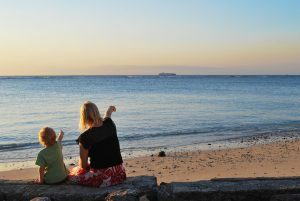 The relationship between a mother and daughter- in-law, can be tricky but cultivating that bond early on can make the family unit that much stronger. This entry was posted in Wives and tagged conflict, daughterinlaws, daughters, love, Marriage, motherinlaws, mothers, Relationships.